Ultra Premium Large Breed Dog Food from Big Dog World. Dogs Dinner Large Breed Adult with Turkey and Cranberry is a delicious recipe for large and giant breeds. With a larger kibble size plus added Glucosamine, Chondroitin and Omega-3 for healthy coat and joints. 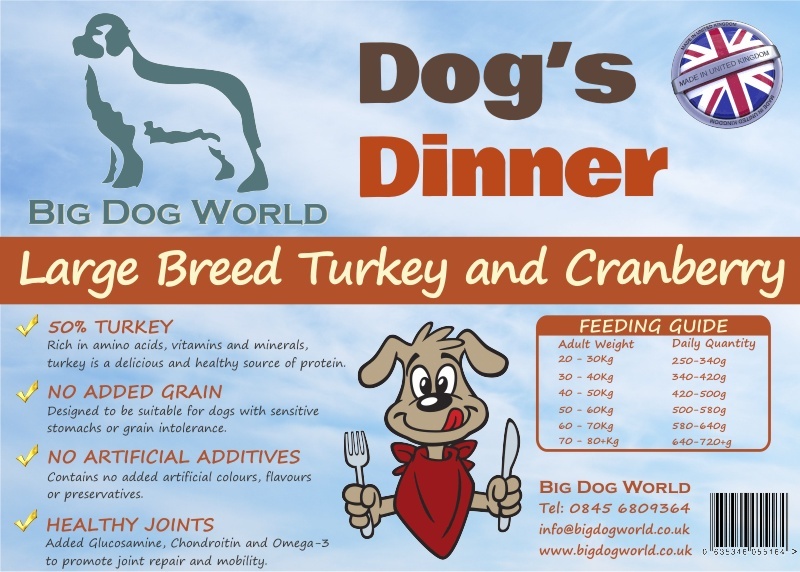 Dog's Dinner Large Breed dog food is made in the UK and contains no added grain making it suitable for dogs with sensitive digestion or grain allergies. It also has a high meat content with no artificial additives such as flavourings colours or preservatives. Turkey 50% (including 26% Freshly Prepared Turkey; 19% Dried Turkey & 5% Turkey Fat); Sweet Potato (24%); Peas; Potato; Beet Pulp; Pea Protein; Potato Protein; Chicken Gravy; Omega 3 Supplement; Linseed; Vitamins & Minerals; Cranberry (equivalent to 7.5g per Kg of product); Glucosamine (170mg/kg); Methylsulfonylmethane (170mg/kg); Chondroitin Sulphate (125mg/kg); Natural Prebiotics (FOS 92 mg/kg; MOS 23 mg/kg). Our Golden Doodle loves this food. And we can ring the changes. Next order will be lamb and mint to keep his appetite fresh. Easy to use website and always very quick delivery. My dog loves the turkey and cranberry grain free for large dogs. Highly recommend. Wow! What a great food. Both my boys - a Newfoundland and a Saint, who previously had to be enticed to eat their food, now wolf down their dinner, I've never seen them enjoy their food so much. More importantly my St Bernard has very sensitive digestion and was suffering from bouts of sickness and frequent wind on his last food - no joke with a saint! He's loving this food, no more illness and no more wind!! Well done big dog world, a great food, thanks so much for the recommendation.